It’s hard to tell exactly what causes costochondritis because it’s typically diagnosed by ruling out other, more serious conditions. Any type of chest wall pain needs to be taken seriously, and a hospital visit is always recommended. If heart disease and a heart attack are ruled out, it’s highly likely that the sternum pain will result in a costochondritis diagnosis. It is considered a temporary pain in the upper chest. And although it’s uncomfortable, it’s not a major cause for concern. Costochondritis is marked by rib cage pain and sternum pain as a result of chest wall inflammation. It brings a lot of people to the doctor’s office or emergency room, thinking that they’re suffering a heart attack when, in fact, it’s just inflamed joints between the rib cage and chest wall. So, what is costochondritis and what does it mean for overall health? For the most part, nothing. It is a harmless condition that usually subsides within a few days. There is no definite cause of costochondritis. And, it can be brought on by anything from exercise to a viral respiratory infection. Lifting heavy weight at the gym or the job site can lead to chest pain, as can overuse of your arms, like carrying a baby. This pain is caused by stress on the joint. The pain can also be the result of various types of infections or as a side effect of an upper chest surgery. But, the usual costochondritis causes are viral infections that cause inflammation or heavy coughing. It’s also worth noting that bacterial infections may result after surgery when the affected area is compromised. Because many factors can trigger costochondritis, pain usually follows an acute trauma or stimulus. These typically involve physical stress like exercise, repeated arm usage, and heavy lifting, or an upper respiratory infection. The pain is usually concentrated at the front of your chest wall near the sternum. It can be dull, but it’s typically quite sharp and can radiate under your arm towards your back on the left, or to your abdominals. As a result, it’s often confused with a heart attack, so the symptoms of costochondritis can be quite scary. Breathing heavily or coughing will worsen costochondritis symptoms, as will trunk rotation. On the other hand, lighter breathing, maintaining a stationary trunk, and not coughing will usually see it improve. Another symptom of costochondritis is a tender feeling when the costochondral junctions (rib joints) are pressed. So, if you don’t feel any tenderness, particularly between the fourth, fifth, and sixth ribs, it’s unlikely that the pain is caused by costochondritis. You may hear your doctor or other healthcare professionals use the term “Tietze syndrome” interchangeably with costochondritis. However, they are actually quite distinct from each other. Tietze is much less common; in fact, it’s quite rare. Unlike costochondritis, Tietze is usually accompanied by swelling. Tietze usually comes on abruptly, with chest pain radiating out to the shoulders and arms lasting up to several weeks, whereas costochondritis doesn’t affect these areas and is usually an acute response to certain conditions or stimuli. Costochondritis is more common in adults over 40 and Tietze typically affects those younger than that. A costochondritis diagnosis is arrived at by eliminating other, more serious conditions. When you head to the doctor or emergency room with chest pain, they will be looking at your vitals to check for heart disease or a heart attack. If those conditions are ruled out, they will likely hypothesize costosternal syndrome, which is another medical term for costochondritis. The doctor will then examine your ribs to see if there is tenderness. To check for costochondritis, he or she will check between your fourth and sixth ribs for swelling, while looking between the second and third ribs to diagnose Tietze syndrome. To test for inflammation, you may be required to do a blood test or a chest X-ray. The doctor may also inquire about any recent upper respiratory infections or surgeries to help get a better idea of what exactly ails you. At the end of the day, if you walk out of the doctor’s office with a costochondritis diagnosis, things are looking pretty good, as long as it’s not heart disease, right? For the most part, over-the-counter (OTC) painkillers are used to treat the symptoms of costochondritis. Exercises won’t really help, but stretches may add some mobility if you’re feeling tightness in the sternum. But, if your chest pain is because of exercise, it’s advised to stay away from the positions that led to the diagnosis. If you do elect to use OTC painkillers like “Motrin,” “Advil,” or “Tylenol,” consult with your doctor first to avoid any complications with medications you’re currently taking or any health conditions you have. There aren’t any other forms of costochondritis treatment other than treating the symptoms of the pain. You can use natural remedies like hot or cold compresses to relieve symptoms. Or, you can try getting plenty of rest to avoid re-aggravation. So, how long does costochondritis last? Usually not very long. Most cases will clear up within a few days or weeks. If you’re hit with a bout of unexpected pain in your upper chest, get to the hospital. 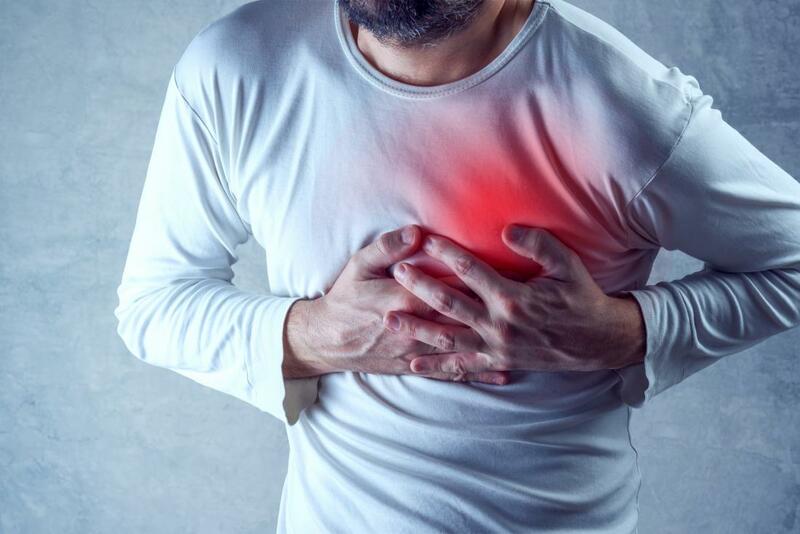 Because costochondritis symptoms are so similar to a heart attack or heart disease, seeking medical attention as soon as possible is required. Although chest wall pain is always a cause for concern, sometimes it may be little more than some bad luck that will keep you uncomfortable for a brief period. And since it’s difficult to know what causes costochondritis, it’s important to be patient while waiting for a diagnosis or treatment to kick in. But most of the time, the symptoms will disappear on their own, and you can get back to life with little, if any, implications. Proulx, A., et al., “Costochondritis: Diagnosis and Treatment,” American Family Physician, September 15, 2009; 80(6): 617-620; http://www.aafp.org/afp/2009/0915/p617.html, last accessed October 25, 2017. “Costochondritis,” NHS Choices, May 16, 2016; https://www.nhs.uk/conditions/Tietzes-syndrome/pages/introduction.aspx, last accessed October 25, 2017. “Costochondritis” University of Maryland Medical Center, November 27, 2016; http://www.umm.edu/health/medical/ency/articles/costochondritis, last accessed October 25, 2017.